It’s just rained and your water tanks have filled up for the first time in months. But the water has a slight discolouration to it, and tastes much different; not as fresh, and it has a little texture to it. Failing to maintain your water tank when it isn’t raining can turn your freshly harvested rainwater into undrinkable mud almost immediately. So here are 5 tips for keeping your water clean and healthy. This is a simple one, but quite often neglected. Especially when there is a drought or periods when you haven’t seen rain in a long time. It’s not just about leaves and twigs that fall onto the roof and get caught in the gutters. Dirt, dust and animal faeces also accumulate on the roof, and when it rains, are washed into your water tanks. Not to forget peeling paint or deteriorating metal roofs. Although you might visually think everything is fine when you are looking at it from the ground, over time the weather slowly breaks down paint/metal/plastics and this slowly leaches into your tanks. Regular checks and clearance of debris will help you maintain a clean base from where you can collect your drinking water. Don’t just think about the trees around your house as being the only cause of debris and tannins leaching into your water supply. Having Trees and bushes around your water tank can cause great problems. Not only can debris make its way into the tank (with or without a strainer), but root systems will gravitate towards water sources. Especially if you have a concrete water tank. It is more common for concrete tanks to experience damage from tree roots, which work their way through the concrete, causing cracks to form. Vines will grow up the sides of tanks searching for a way in to the water source. 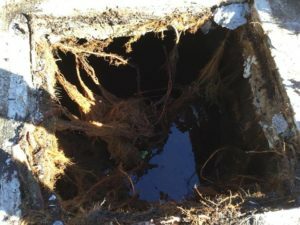 Keeping the roof and gutters clear of debris and ensuring tree roots are not working their way into your water tank won’t prevent your water from being contaminated. Dirt and Dust will always make their way into your tanks each time it rains. This includes faecal matter from birds, insects and animals. 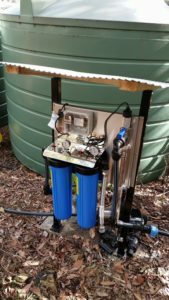 To ensure you have healthy drinking water you should install a Whole of House filter with Ultraviolet system. The filters will remove the very fine particles of sediment that cannot be seen by the naked eye, and the ultraviolet system will kill 99.99% of all bacteria. At the very least, installing an under-sink filtration system will provide you with filtered water. However, just be aware that showers, bathroom basins etc are still susceptible. You would be surprised how many people neglect these! Debris from the roof can make its way to your tank, and a strainer can do a lot of great work of holding a lot of that back. But unless you clean it regularly and remove the rubbish that builds up, they’re rendered useless. In this photo you can see a strainer that has had dirt and debris build up to a point where vegetation has started growing! 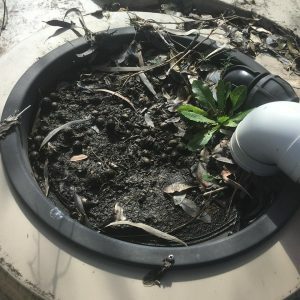 Not only does it make it harder for the water to flow into the tank, but you are washing smaller particles of dirt and debris in every time it rains. Leaving the internals of your tank for years, even if you are implementing the above 4 approaches, will slowly see a build-up of sediment on the floors and walls of your water tank. Simply just “washing it out” using a pressure washer won’t clean your tank to a level for drinking water. And besides, you will need the tank to be empty and will use a lot of water in doing so. Pristine Water Systems has developed the Quadclean™ process for cleaning water tanks. We vacuum the sludge from the bottom of the tank, aerate and filter the water to give it life, sanitise the water to remove bacteria, and test the water to ensure it is ready for consumption. All of this is done with minimal water loss, and while you still have water in your tank! 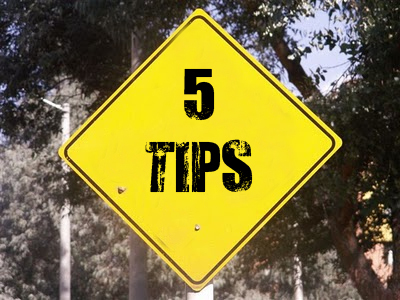 So if you follow the above 5 tips for having crystal clear Tank Water, you will have very few problems with your water supply.